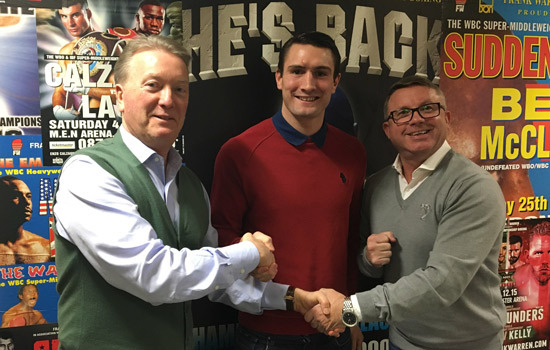 Undefeated British, Commonwealth and WBO Inter-Continental Middleweight Champion Tommy Langford has signed a new long-term promotional deal with Frank Warren. The hugely popular Baggies fan enjoyed a memorable 2016, picking up the Commonwealth and Lord Lonsdale belts, and is now looking forward to an even bigger 2017. Ranked at number two in the world by the WBO, Langford is eyeing some huge fights in 2017 and is close to landing himself a world title shot. Now the proud owner of the famous Lord Lonsdale Middleweight belt, Langford is determined to win it for keeps. 27 year-old Langford kicked-off 2016 by picking up the Vacant Commonwealth belt against a tough Lewis Taylor at the Liverpool Echo Arena in March. Two weeks later Langford and his wife Leanne celebrated the birth of their son, Freddie.